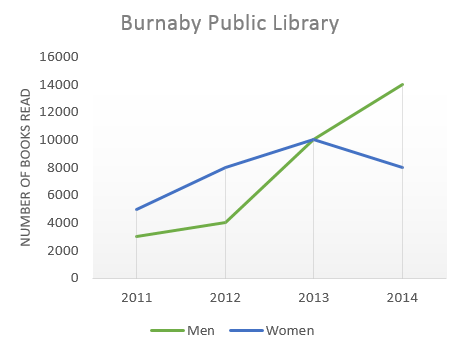 The graph below shows the number of books read by men and women at Burnaby Public Library from 2011 to 2014. The graph gives information about Burnaby Public Library between 2011 and 2014. It shows how many library books people read over this four-year period. As can be seen from the graph, there were different trends for men and women. The number of books read by men increased steadily between 2011 and 2012, from about 3000 to 4000. After that, the number rose dramatically to 14000 books in 2014. This was the highest figure in the period. Women started off reading more books than men, but their numbers followed a different pattern. Between 2011 and 2012, there was an increase of 3000 from 5000 books to 8000 books, and then a gradual rise to 10000 books in 2013. However, in 2014, their numbers fell back to 8000 again. Overall, there was a strong upward trend in the number of books read by men. Although women read more books than men in 2011, their reading fell to below the level of men in 2014.